Maddie Meyer/GettyTom Brady may be sticking around for at least two more years. The New England Patriots restructured some of Tom Brady’s contract and gave him an extra $US5 million in incentives this season. According to reports, the Patriots gave Brady $US5 million in incentives this season, tied to being in the top five in various statistical categories. If Brady hits all of them, he can make $US20 million this season, a hefty number, but one that still falls short of most top quarterbacks. It’s unclear why the Patriots gave him money in the form of incentives rather than doing a new deal, as they have in the past. But according to The Boston Globe’s Ben Volin, the deal also may contain a subtle hint about Brady’s future with the team. The Patriots did restructure some of Brady’s deal this year. Whereas he had a base salary of $US10 million, with a $US4 million signing bonus (plus $US1 million in in-game incentives), the Patriots instead turned it into a $US10 million signing bonus (meaning he got money upfront) and changed his base salary to $US4 million. 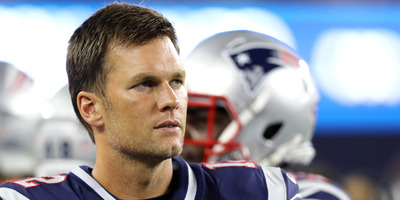 According to Volin, that doesn’t change Brady’s cap number this year, but it did push some money back into 2019, raising his cap number from $US22 million to $US27 million. The deal also raised his dead cap number (money a team owes a player if he gets traded, cut, or retires). In essence, the Patriots gave Brady some money upfront now, while locking themselves into more money in the future. That’s a bold move for a team to make with a 41-year-old quarterback. It may be why the Patriots tied $US5 million in incentives this year – they may want to make Brady prove he can play at a high level this year if they’re going to lock in money for him next season. Furthermore, as Volin noted, Brady skipped voluntary OTAs (something he hasn’t done in years) but worked out down the street at his facility. Perhaps the Patriots want to make Brady prove himself after waffling on his commitment. Even with Brady hinting he won’t be around for long, it seems both he and the Patriots are confident he’ll play until at least 2019.